These have been heady days for cyclists in the West, as cycling begins finally to regain its rightful share in the transportation mix. Once the province of daring lone-wolf commuters in the US, Canada, and the UK, utilitarian cycling is much more often now the province of ordinary blue or white-collar folks on the way to work, shoppers, diners, or students--persons for whom the bicycle is a satisfying and effective way to get around town, not a facilitator of sporting contests or white-knuckle adventure. Inevitably, perhaps, a backlash has developed, founded mostly in the more conservative sectors of society in the English-speaking nations, where the car is most formidably entrenched. This is paradoxical, as the values of self-sufficiency, efficiency, and low cost of infrastructure inherent in the bicycle are also core conservative values. This is likely because the bicycle is also associated with environmentalism, seen as a "left-wing" cause, and with demands for more tax-supported infrastructure--of the sort, ironically, that drivers have demanded and received for nearly a century, to the exclusion of all other modes. Perhaps another factor is that the bicycle, while the most traditional of highway vehicles, is seen as a challenge to the intervening tradition of motorcar use, which is all most current conservatives in the English-speaking west remember. That cyclists "don't pay their way," as they don't pay road or fuel taxes. That cycling infrastructure is "too expensive," and that removing some automobile infrastructure to make room for cyclists will be "bad for business." We will examine these objections in the economic terms that the largely conservative oppositionists readily accept as valid. Though of course economic efficiency is hardly to be sneezed at by liberals or progressives either! "Cyclists Don't Pay Their Way"
Even a cursory examination of highway funding structures, present or historical, is enough to reveal the utter fallacy of this statement. Cycling advocates often attempt to counter that argument by stating that most cyclists also own cars and so do pay road and fuel taxes. In fact, they too are wrong: cyclists who also drive are not paying enough to cover their use of the roads--because they also drive. We will leave out the full-cost accounting practice of including externalized costs such as pollution mitigation, watershed degradation, medical costs incurred by sedentary nature of driving, and all that--valid though they are--and confine ourselves just to road costs. The fact is that, in the English-speaking nations, road and fuel taxes come nowhere near paying for the costs of building and maintaining the roads, highways, and parking spaces that motoring requires. The Asset Value Index is the ratio of the total expected revenues divided by the total expected costs. If the ratio is 0.60, the road will produce revenues to meet 60 percent of its costs; it would be "paid for" only if the ratio were 1.00, when the revenues met 100 percent of costs. Another way of describing this is to do a "tax gap" analysis, which shows how much the state fuel tax would have to be on that given corridor for the ratio for revenues to match costs. Applying this methodology revealed that no road pays for itself in gas taxes and fees. For example, in Houston, the 15 miles of SH 99 from I-10 to US 290 will cost $1 billion to build and maintain over its lifetime, while only generating $162 million in gas taxes. That gives a tax gap ratio of .16, which means that the real gas tax rate people would need to pay on this segment of road to completely pay for it would be $2.22 per gallon. Cyclists impose virtually no wear on road surfaces and require very little space for travel lanes or parking (you can park twelve bicycles in the space of one car). Driving is subsidized--sometimes to an extent that would never be accepted for, say, a transit system--and the money for that subsidy comes from various other taxes--income, sales, property, or a mix thereof. This indicates that cyclists (and other non-drivers including the users of more spatially-efficient transit) are paying excessive taxes in order to accommodate motoring. Todd Litman of the Victoria Transport Policy Institute puts it succinctly. Litman notes that car lanes in North America typically cost about five times more to build than bike lanes. When you put it all together and do the math, Litman reckons a city's road network costs every taxpayer a few hundred dollars a year. The elephant in the room here, rarely mentioned, is that all that asphalt pays no property taxes, and so requires that taxes be higher on homes and businesses. Allowing residents the choice to bicycle rather than drive, by providing appropriate infrastructure, will relieve these burdens. "It's Too Expensive! It's Bad for Business! We're Not Europe!" But, in the English-speaking West, the roads are already here; bike routes, paths, racks, corrals, and so forth are, in most places, not. 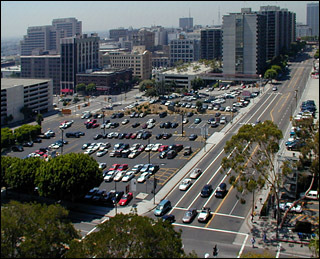 Conservative naysayers seem to think that we have achieved an ideal of urban form in the highway-dominated city (and suburb), and that now adding bicycle infrastructure would "cost too much" and be "bad for business"--the latter effect resulting from "road diets" and other initiatives that remove some car travel lanes or parking spots to make room for bike lanes or parking corrals. 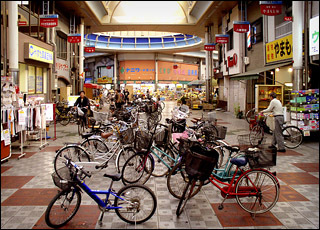 Fortunately, there are examples of successful and inexpensive bicycle development in the English-speaking nations as well as on the Continent (and Asia--Tokyo and Osaka stand among the world's great bicycle cities). The new biking push is expected to cost $600 million over the next twenty years.... 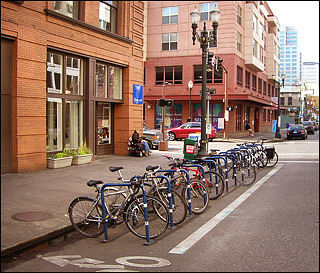 Between 2001 and 2007, bike facilities comprised less than one percent of Portland's overall capital expenditures for transportation but carried between 3 and 7 percent of all trips. The new plan will push bike infrastructure to 5 percent of the city's total transportation budget. But there's a good reason so many cities are eager to follow in Portland's footsteps. The city has found that promoting cycling more than pays for itself. 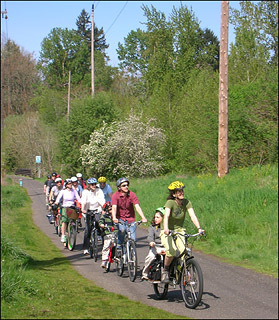 Biking is a selling point for attracting tourists, and a recent study from CEOs for Cities shows that Portland keeps $800 million that would drain out of town if local residents drove cars at the same rate as an average U.S. city. By spending less money on gas and less time on the highway, the study concludes, Portlanders have more of both to spend at local businesses. A modest investment in cycling, it seems, results in a great return for the local economy. The value capture of cycling infrastructure exceeds that of automotive roads and parking by a large margin. Forget, then, all about Global Warming, air pollution, personal health, freedom of choice, or anything else when speaking to conservative-leaning oppositionists: the fact is that supporting bicycling infrastructure in our cities is the most fiscally responsible program for supporting the mobility our economies depend on. The more you support cycling, the less you'll have to pay in taxes, and the better your business communities will thrive. The bottom line has spoken.